With just a few days to go, take a few moments to read an article in FLAGPOLE about this weekend's events HERE. Adv. 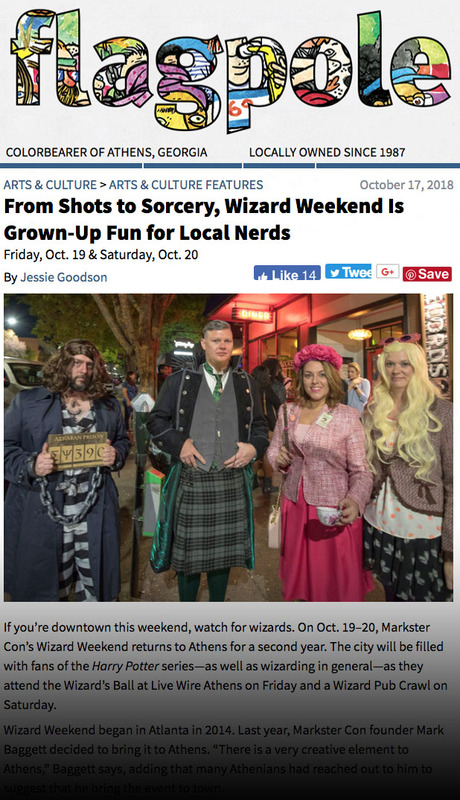 tickets are still available to BOTH events with the WIZARD's BALL hosted at Live Wire Athens on Friday night (10pm-2am) and then the WIZARD PUB CRAWL the next day, with registration at Iron Factory (from 4-8pm). Other bars participating are Flanagan's Irish Pub, Sand Bar and Boar's Head. Feel free to break out your house colors, grab a bunch of friends (half-blood or not) and come out for a great, geeky time.